Lets talk about the feeds and the speeds, and the birds and the bees. First I want to say hello to everyone, this is my first post on this forum. I wanted to write a topic that I hope will contribute to helping people who are new to machining by providing a better understanding of how a tool works in relation to the material. Disclaimer: Please understand that my experiences and theories are based on personal experience with large commercial CNC routers and not with the X-Carve; however, tooling interacts with the material being cut the same regardless of the machine size. I have spent the better part of a decade using CNC routes to cut flat sheet materials, mainly plastics. While I have been factory trained and have industry experience I will not claim to be an expert in the field of CNC routing (or grammar). If you don’t agree or see errors in my thinking please feel free to speak up, we are all hear to learn. If we could slow down time and witness what happens then a spinning tool is moving linear through material we would see that the flute (the void just before the cutting edge of the tool) is where all the magic happens. This flute allows material to be pushed inside of the tool which is then immediately sliced away. This amount of material that is inside the tool to be cut away is the golden key to CNC heaven. The material cut away is called a chip, this chip is not only pushed into the flute after cutting and ejected, the chip also carries the heat of the tool out with it. Yes, the stuff that is making a mess of your shop is the same stuff that is stopping your bits from turning red hot after an hour long job. The thicker the chip that is sliced away the more heat the chip can be carried away from the bit. If you are not letting enough of a chip be created inside of the tool flute you are not removing any heat and you will burn your material and your tooling. You should be making nice uniform “C” shaped chips. You should be able to touch your tool after a cut job and it should be warm but not burn you. Why is correct chip load important? It results in the three best things we as CNC operators can ask for. Longest tool life, cleanest cut, and fastest possible job time. Remember though that Chip Load recommendations are just that - recommendations. They are the best place to start and then troubleshoot to refine from there. Here are the three possible ways to calculate chip load. You will need to know any two variables to solve the third (chip load, feed, and rpm). Typically you will know chip load and also know a RPM or a Feed that you wish to run out, and solve for the other. Example: We will use a single cutting edge tool that requires a .005” chip load. And we are running a spindle at 16,000 RPM. If you play with the formulas enough you will notice that you can get the same Chip Load with different Feed or RPM numbers. We are still using a Single Cutting edge tool. Basically you can get the benefit of decreasing RPM by increasing the Feed and vise versa. The number of cutting edges you have is basically multiplying the RPM of the spindle. If you have one cutting edge then your tool is only slicing one chip away per revolution. If you have three cutting edges then our tool is slicing three chips away per revolution. This means if I we spun the three edge cutting tool at 1/3 the RPM as the single edge cutting tool we would get the same size chip and theoretically the same quality of cut. Multi edge tooling is good for slower spindles as it allows the machine to act as if it has a much faster spindle and in relation allows for faster feeds and quicker job times. Think of cutting aluminum on a mill that has a 10,000 RPM max spindle, if you put in a three edge tool you have basically increased RPM to 30,000 as you are taking three cuts per revolution. Single edge tooling is good for machines with faster spindles (Like a X-Carve with a trim router). You are cutting once per revolution, giving the tool time to take a larger chip out of the material. Note that this info is just a generalization I have come up with over time. Smaller tools are easier to spin and in my experience put less lateral force against your material allowing you to hold down you’re work piece with less force. Their cutting edge is also traveling at a slower speed than an larger tool at the same RPM (remember that the outside of a wheel is traveling faster than its hub). This reduction in speed means that a slower Feed or higher RPM is typically required than that of a larger tool. I have seen that smaller diameter cutters typically leave better edge finish along the top edge of the cut if the material is prone to chipping (think plywood, or a painted surface) as the amount of material being sliced away with each revolution is smaller. I have learned the hard way that tools are rarely the diameter they claim to be. A .25” endmill can easily be .245” in diameter and result in parts that are larger than expected. If you are working with something that needs to be + - .01” tolerance and you start off with a tool that is .005” different in size than what you tell your CAM software you are already halfway to having you part out of spec. So always measure you tool. When you are moving a tool downward in the Z axis into a material it is commonly called a Plunge Rate. Please keep in mind that while most flat endmills are designed to be able to plunge downward, they are still a poor design and inefficient when compared to say a drill bit that is only designed to move down and never side to side. All tools behave different in plunging based on their tip design. I have never used a formula (I am sure someone has one out there) for plunging but I typically start somewhere about 1/10 of my linear Feed Rate and see how that goes as a starting point. You will know if you are doing it right as you will get a nice continuous coil of material (if cutting plastic or aluminum) that is being removed from the hole. If you are going too fast you will get a horrible chattering sound and moaning sound. If you are going too slow it will burn or melt the material you are cutting into. This is a topic I don’t know very much about and would like if someone with experience could chime in. This is typically measured as Cubic Inches per Minute. And has to do with the physical amount of material displaced. It is mainly calculated when milling and especially when doing aggressive high speed milling. (Not typically calculated for flat sheet cutting and mild pocketing). This basically means are you feeding your tool around the tool path either clockwise or counter clockwise (this has nothing to do with the direction the spindle is spinning it is alway spinning the same). Some materials benefit from Climb cutting and will provide a superior edge finish. Basically when Conventional cutting you are running the tool clockwise around your path and the tool is spinning clockwise at the same time, thus, the tool is pushing its cutting edge toward the rear of the cut path. When Climb cutting the tool is spinning clockwise but is being driven around the path counter clockwise, which means the cutting edge is driving into the material in a forward motion. There is a very simple way to determine if you need to cut Climb or Conventional. Simply cut a line running from the front of the machine to the back that is a few inches long. If the cut is cleaner on the left side of the cut then you should run the material with a Climb and if the cut is cleaner on the Right of the line then cut with a Conventional. When in doubt Conventional cutting is well...conventional. Melted/Burned material or charred endmill - Lower RPM or Increase your feed speed. You are generating too much heat in the tool as a result of not taking large enough chips of material away with each revolution. You need more material to make its way in the flute on the cutter before it gets sliced away by the cutting edge. Either moving the material into the flute faster will increase the chip size or slowing down the revolution to give more time for more material to enter the flute will decrease tool temperature. Remember you should be able to touch your tooling immediately after a cut and it should only be warm and not hot. Chattering - Slow down your feed rate or increase RPM. This means there is too much lateral force against the tool and it is beginning to bend and deflect its cutting edges away from the proper cut path. Most likely you are trying to put more material into the flute per revolution than there is room for (you are basically gagging the tool by shoving too much material down its throat). When you are getting chattering and deflection you are dangerously close to breaking you tooling which can cost you money and is very dangerous. I have personally had a bit break and fly across the room passing between me and a coworker about two feet next to me and bury itself in a wall (wear your safety glasses). While I have typically only used solid carbide tooling (I was spending other peoples money on tools not my own) HSS or High Speed Steel has more flex to it and can tolerate more chatter and more force against it unlike Carbide which has superior long term sharpness but is very brittle. Your tool should not sound like Adam Savages “Duck Bomb” - if it sounds bad, there is a good chance it is not cutting optimally. Now have fun and wear your eye protection or the CNC gods might throw a 1/8" Super-O Flute bit flying by your head. What bits to use for certain materials and jobs? I bought a X-Carve.. Now what? What value first in feeds and speeds? And what about Inventables bits? Excellent post, thanks for sharing your knowledge! Lets just hope I don't throw all of this info out the window when my X-Carve shows up. Welcome to the forum. What a great way to start. Having a concise all together primer to feeds and speeds on this forum is a much welcome addition. Thanks! I feel like I just enrolled in X-Carve University. Thank you for your knowledge! XCU... Home of the "Flying Chips"
Thank you for sharing @RichardShannon! I am just getting started with my X-carve and this knowledge you shared about feeds and speeds probably saved me numerous broken bits and hours of frustration! 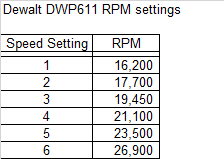 Excellent post, the only thing I can add is that if someone is using the Dewalt 611 router the available RPM range is pretty high. The lowest setting is about 16,200 RPM which is pretty fast for most multi flute tooling. So as a general rule of thumb I have found that the Delwalt works much better when the setting is kept at 3 or below. Higher settings can cause the bit to overheat. Great post, very informative and much appreciated. This should help out a LOT of users who are unfamiliar with cut settings. I just re-read my post and I think I have flip flopped conventional and climb cutting. I need to revise it tonight. I have not setup any tooling in nearly 6 months so I need to knock the cobwebs out a little. An yes, the "Duck Bomb" is amazing and also the thing of my nightmares at the same time. I am no professor, I have just broken a lot of bits and damaged a lot of material. Just think of me as the kid that has flunked the class so many times, I just can't help but to finally absorb the lecture. This is a very well-written post! Once you get into x-carve and other home made CNC machines another variable (actually about 1,000 other variables) are introduced. Not the least of which... in fact the MOST of which is machine rigidity. These machines are not as structurally sound as commercial machines. And most, immediately after assembly require hours and hours of modification, squaring, flattening spoil boards, etc. So, most x-carve users will never really experience optimum chip loads or that beautiful "sweet spot" sound. Most will subject the first .05" of their tool to overuse, dulling that section while the rest of the razor sharp flutes remain unused. The DIY CNC world is one of aspiring to commercial standards but compromising within the context of EACH individual machine. Because they are all very, very different and have very different capabilities. Once bits 1/8" and smaller are connected to a DIY machine ANYTHING can happen. The only optimum is what your machine on THAT day, in THAT material are capable of handling. X-Carvers are survivalists, and innovators. Long after I angrily gave up on that pathetic 24v stock spindle, others found very clever and resourceful ways to make amazing things happen. Even in aluminum. I could not and would not have persisted to achieve their results. .01" DOC with 20 IPM feed rates? But the results speak for themselves. In short, the best results are achieve via experimentation on your machine. As often defying conventional wisdom as seizing upon an important nugget of wisdom offered by a real pro (@RichardShannon) generous enough to share their hard earned know-how. I have learned the hard way that tools are rarely the diameter they claim to be. A .25” endmill can easily be .245” in diameter and result in parts that are larger than expected. Wouldn't this result in a part that's smaller than expected rather than larger than expected? Assuming you’re cutting an outside profile, a too-small diameter results in a too-large part. One can preview this sort of thing in a vector drawing program by off-setting paths by half the ideal diameter, then assigning a stroke equal to the actual diameter. No, if the tool is smaller the part cut is larger. If you are cutting a square that is 10"x10" your CAM software will generate an offset tool path that places the tool outside of the 10"x10" part. This is done so that the kerf of the cut (the material removed by the tool) is outside of your part. If you tell your CAM software that your tool is .250" in diameter it will place the centerline of the square tool path .125" outside of the part (called tool offset). If you then cut this toolpath with a tool that is .245" diameter and it is riding on the same .125" offset toolpath you are now leaving .0025" extra material along your toolpath as the centerline of the tool is .125" way from your part instead of the correct .1225". Because we are cutting a closed shape and not just an open line our part is being cut on all sides which means this increase is happening on all sides. Your final part is now 10.005"x10.005". If you are finding your parts are equally inaccurate in both the X and the Y then your tool should be the first thing measured. The kicker is you need to measure the cutting diameter not the shank. The shank will be groud to a cutting edge resulting in it being slightly smaller. To take your spindles runnout in consideration you can cut a slot in a clean cutting material and measure the width of the slot and use this as an accurate tool diameter for your CAM generated offset toolpaths. Ah, I didn't consider the outside profile. In the case of an inside profile or a pocket, this would result in under-sizing though correct? Correct, a pocket will be smaller.